The Clearwater Pool System is the closest thing possible to a chemical free swimming pool as you can get. There are two technologies that make up the system. 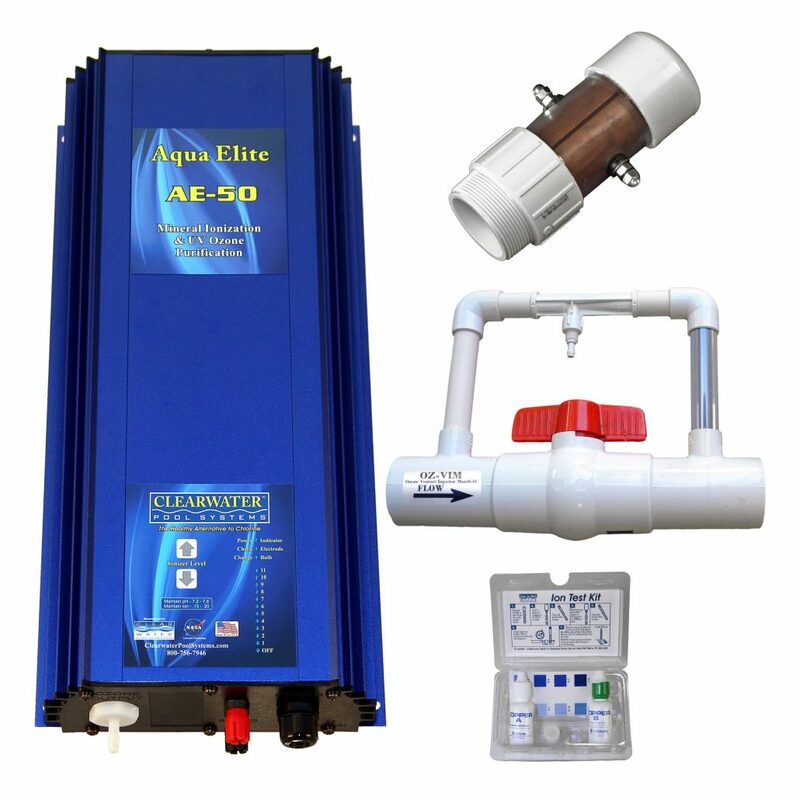 One of the technologies is a swimming pool ionizer called the MineralPURE System. The other one is an ozone pool system called OzoneMAX. 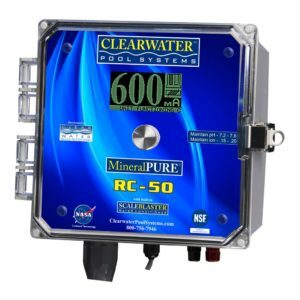 These systems are available either individually or as a combo system called the Clearwater Pool System. The MineralPURE ionization system consists of a state-of the-art micro-processor control box and a scientifically designed set of electrodes composed of copper or copper/silver. These are set slightly apart from one another. Water is passed through a specially designed flow cell chamber that houses the electrodes. The control box works by generating a precise, low-voltage, DC current (at milliamp levels) to the electrodes. Basically, the current causes some of the outermost atoms of the electrodes to lose an electron, thus becoming positive ions. While the water is running through the chamber, many of these ions are swept away before they can reach the other side of the electrodes. As a result, copper or copper & silver ions are dispersed into the body of water that is being purified. 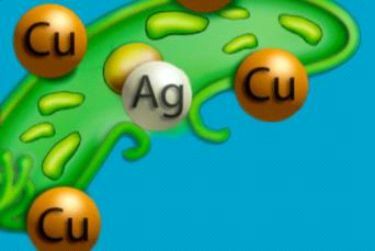 The copper ions help control algae. The silver ions help control bacteria and viruses. 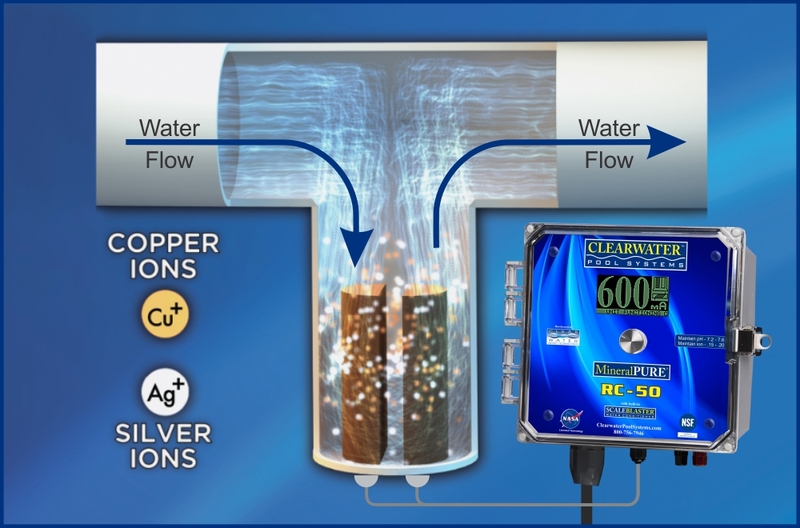 The greatest benefit of copper or copper/silver ionization is that the ions remain in the water providing a residual protection. They provide long-term, nontoxic purification and prevent against recontamination. Unlike most types of sanitizers, the copper and silver ions remain in the water until they flocculate, or form masses with the algae and bacteria and then become large enough to be removed by the filtering equipment. 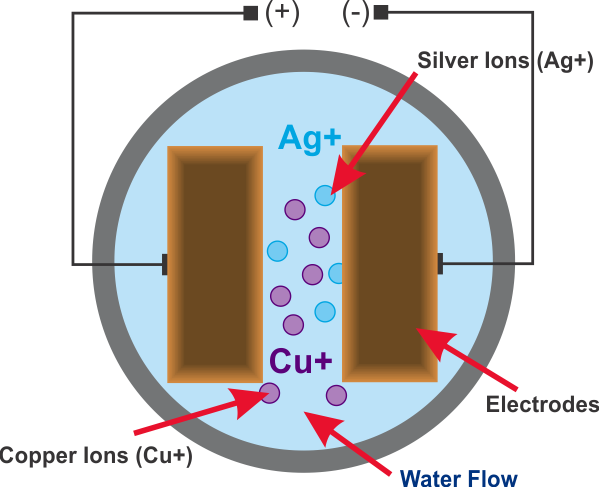 When the “used” copper and silver ions are removed, the microprocessor control box is always producing new ions to continuously sanitize the water. 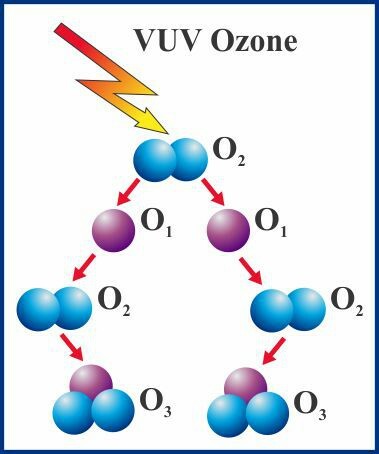 Ozone is produced by splitting oxygen molecules with an ultraviolet lamp. 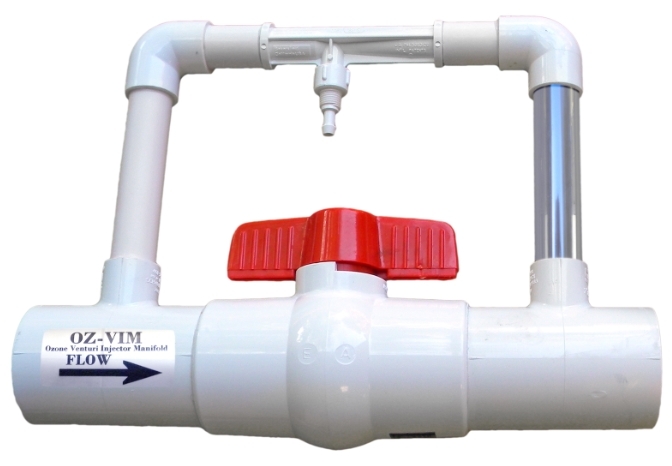 This produces a pair of unstable atoms (O1) that will combine with normal oxygen molecules (O2) and form ozone (O3), which is injected into the water by a Venturi manifold (included with the system). 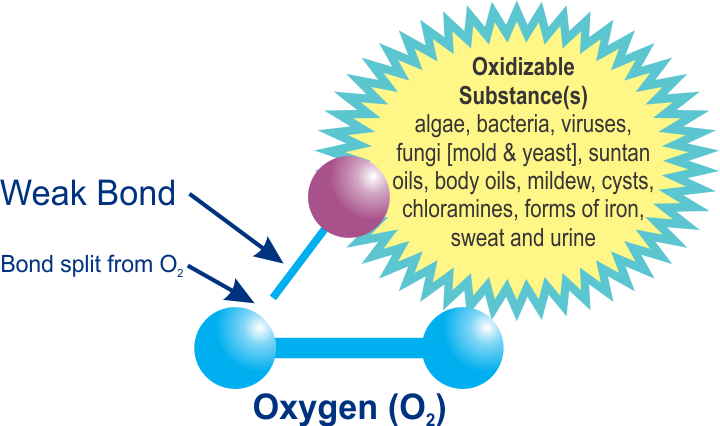 An oxidization reaction occurs upon any collision between an ozone molecule and a molecule of an oxidizable substance(s) (i.e. algae, bacteria, viruses, fungi including mold and yeast, suntan oil, body oils, mildew, cysts, chloramines, forms of iron, sweat and urine). These oxidized compounds then “clump” together, thus greatly enhancing the ability of your filter to capture these organisms from the water. Once the ozone loses the third unstable oxygen molecule, it simply reverts back to the life breathing oxygen. The weak bond splits off leaving oxygen as a by-product. 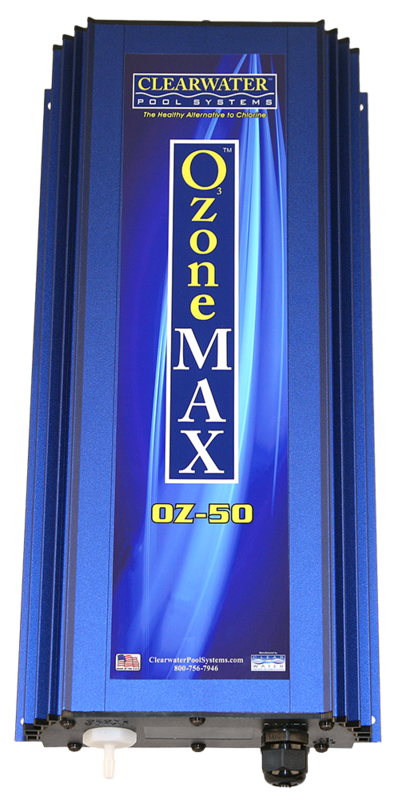 The OzoneMAX unit includes a side-stream Venturi manifold that injects the ozone into the water. 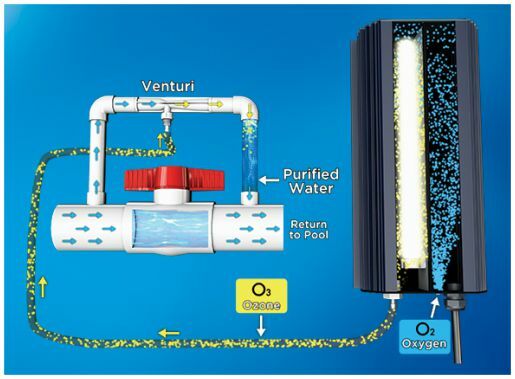 As ambient air enters the ozone generator, the Venturi creates a suction-effect to pull air past the UV bulb, creating O3 – ozone. The ozone is then safely injected into the water flow and “instant purification” takes place at that time. With seconds, the ozone is dissipated by the time it returns to the pool.